Hi, I am Sharon Christie, your nurse attorney for Social Security Disability Benefits. 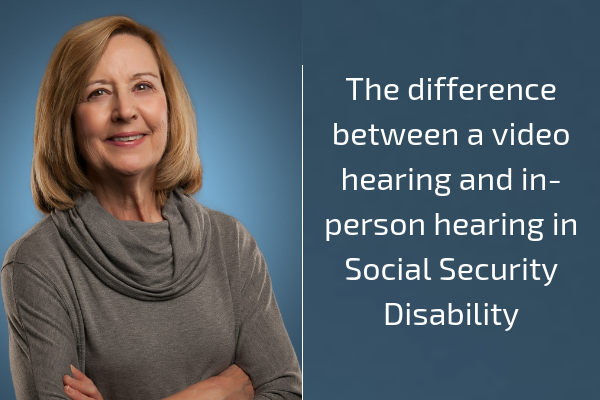 Let’s talk about the difference between a video hearing and in-person hearing in Social Security Disability. Many hearings they are held by video, what does that mean? That means that you are sitting in a soft courtroom with your lawyer and the judge is in her or her office, and you are communicating on a video call. It is like Skype but it is better quality. Now, what is the difference between an in-person hearing and a video conference hearing? Well, the first one obviously is that the judge is not there in person to see you directly. In this case, this is no problem at all, but it really depends on what your disabling conditions are and whether there really is a need for the judge to be able to see you physically. So let me give you an example. I represent a few clients who have conditions that cause deformities of fingers or hands or feet or may have some skin discoloration. Now in those cases, I definitely want to have an in-person hearing because I think the judge can see those aspects of your problems much better in person than over a video conference call. On the other hand, if I have clients who have problems say with severe back pain which is well documented in their medical records. We have MRIs and EMGs and nerve conduction studies and lots of objective evidence to support that claim then I think those claims can be handled very easily by a video conference call. In my practice what I do is look at each case individually. I look at what the problems are that a client has. What are the most important symptoms that we want to describe to the judge and make a decision as to whether it is the case it should be in person or on video? Those are some things that you will want to know if you are deciding whether you want a video hearing or not.